Dozens of water bottles filled with murky brown liquid littered the surface of table tops in the George Sherman Union. The bottles symbolize the polluted water of Bhopal, India, the site of what is widely considered to be the worst industrial disaster in history. 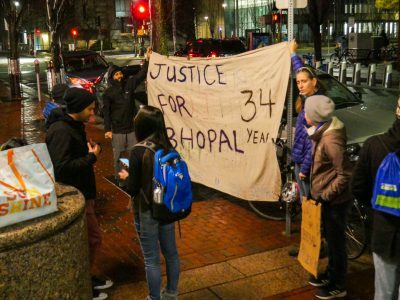 The signs that accompany them call for Boston University President Robert Brown to be held accountable for the people of Bhopal. A dozen protesters gathered outside of the John and Kathryn Silber Administrative Center Sunday evening to speak out against Brown’s involvement with DowDuPont Inc., the company responsible for the Bhopal disaster. On Dec. 3, 1984, a leak of methyl isocyanate gas at a Union Carbide Corporation facility caused hundreds of thousands of injuries and thousands of deaths. Union Carbide is now owned by DowDuPont Inc., a company that Brown serves as a member of the board of directors for. Activists said that the company should take responsibility for the chemical leaks into the water and soil that are still affecting the citizens of Bhopal, causing birth defects and developmental disabilities. Braving December winds, protesters and speakers called on Brown and DowDuPont to be held accountable and properly clean the results of the disaster, over 30 years later. According to an organizer, the group held water bottles filled with polluted water from the Merrimack Valley, a region in northern Massachusetts and New Hampshire that suffered from gas leaks in September, to symbolize the chemically contaminated water many residents of Bhopal are still drinking today. Somnath Mukherji, of Boston, a development coordinator for the Association for India’s Development, attended the vigil and and said he felt DowDuPont’s treatment of Bhopal was a form of “environmental racism.” The activist also said that some companies had to pay more to aid otters in an Alaskan oil spill than DowDuPont paid out to victims of the Bhopal disaster. Mukherji described to the group of protesters what he saw when he visited Bhopal — second and third generations since the disaster suffering from serious health issues, people drinking from poisoned water pumps and the social ostracization of the Bhopali because of the contamination. Mukherji said he would like to see a clean-up of the chemicals, which would allow for the people of Bhopal to finally begin healing physically, socially and economically. Srikant Sarangi, another activist, said he volunteered at the Sambhavna Clinic, a healthcare facility that provides free medical care to victims of the Bhopal industrial disaster. He said that he believed Bhopal is part of a larger problem, using the bottles of polluted water from the Merrimack Valley as an example. Sarangi said the only way forward is to combine forces to attain justice. He also said education is an important component of this change. Katie Irwin said she organized the protest and was moved to plan the vigil for the 34th anniversary of the disaster after learning about the Bhopal industrial disaster in an environmental studies class. When she moved to Lowell and heard that Brown was on the DowDuPont board of directors, she said she decided to take action. Monica Briggs, 51, was similarly disturbed by the disregard for the people of Bhopal. “It’s intense and frightening because nothing really has been done about it,” Briggs said. Briggs, an environmental activist from Jamaica Plain, said she also struggled to grasp the magnitude of the disaster. The protesters ended with a moment of silence for the victims of the industrial disaster. “Bhopal is an example of what happens when a bottom line becomes the only thing that matters,” Sarangi said.